Looks like both of my novels are now up for purchase on Amazon.com. I’ve been looking to see them there for a while (about 9 weeks), and expected to get a notification from Lulu about them when they did. That never happened. I kept checking the globalReach page for Bag of Snow and nothing on the page for it changed. Today on a whim, I decided to search for my full name instead (“Andrew Arthur Green” as they were authored) and they both were there. They look to be the edited/updated versions as well. Funny enough, they are discounted without any doing on my part; down from $13.00 to $11.70. I don’t know what that means for my revenue, but I really don’t care how much money I make on these. Finally, a benefit for them being on Amazon now is that if you have Amazon Prime you can get free shipping. 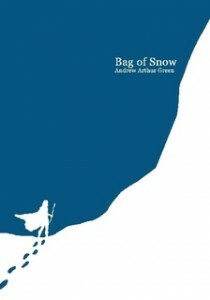 Also if you are inclined and adverse to Amazon, Bag of Snow is up on Barnes & Noble as well. Rusted Halo isn’t up there for some reason. They are both still up on Lulu.com as they were before. It’s been a long road. After starting my first novel back in November 2004, here I am almost 10 years later and both of my books are available in a printed form. Both novels were written during a writing challenge called NaNoWriMo, otherwise known as National Novel Writing Month. The goal is for the writer to write a 50,000 word fiction novel over the entire month of November. That boils down to about 1,600 words or about 3 full pages each day. That means most writers have to churn out that much copy each and every day without any breaks. Skip or miss a day, and the creator easily gets behind (which is a very common occurrence). The challenge is just to get words and thoughts down on paper or stored electronically. The end goal is to not have a finished and edited piece, but just to complete the exercise and work out story ideas. It’s meant as practice to becoming a better writer. 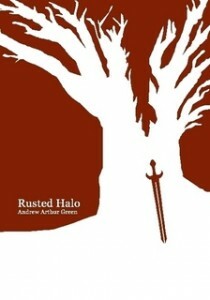 I originally wrote my first book, Rusted Halo, for NaNoWriMo 2004. I produced a complete fantasy story filled with detailed lore and with a beginning, middle, and end. It follows the story of a warrior named Donovan and his travails through his life. The tale is somewhat dark as I tried to break from the standard “happy” fantasy norm I was accustomed to reading. The following year in 2005, I wrote a pseudo-prequel called Bag of Snow that starred another character named Marissa. However, her story ended unfinished with a cliffhanger. I tried to reverse from what I had previously written, and chose to write a cheerful, funny, and happier story than the first book. I also tried my hand at writing about relationships. Both times I reached over the 50,000 word mark, and both times I was very proud of my accomplishment. What I wasn’t proud of was how stressed and angry both challenges made me during the month of November. Therefore, I did not continue to write after the second novel. I also never felt the time was right to set aside the hours needed to polish each story. Both novels essentially sat in digital storage for years. During that time, a running gag in Jessica’s Amazon Wish List was that she requested printed versions of the books. Year upon year, those requests stayed on her list. That was until 2013, when I finally decided to attempt finishing both books. And so during this past November, I began revisiting Rusted Halo. Starting in November and running into December, I returned to both books, editing and tweaking where I saw fit. I worked on cover and interior artwork that I felt was appropriate, and I also got them formatted and ready to self-publish via Lulu.com. Finally, I was able to get some assistance from a co-worker to review and suggest edits for both books (more info about her contributions is below). 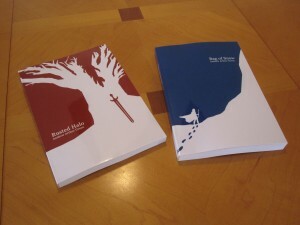 So as of today, both books are available for purchase via Lulu.com (and other booksellers) for those that are curious. Note, the bigger retailers seem to be selling them at a nice discount for those who are interested. Lulu.com is a self-publisher that prints books on demand, and they actually have a very impressive product. The samples and final copies I ordered for myself are pretty much indistinguishable from standard retail books. In fact, both novels have actual ISBN codes like “real” books! 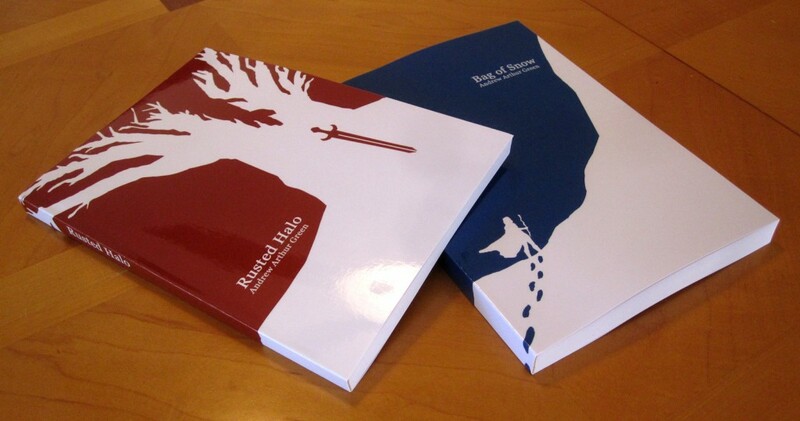 I chose to format both books into paperbacks, as I personally prefer to read fantasy novels in this format. The quality of the writing and stories somewhat follows what you might get out of a paperback fantasy. They are currently priced as cheap as I can make them ($13 a piece) on Lulu.com and still be able have them be available on Amazon, Barnes & Noble, and other booksellers. I do get a few nominal dollars if you do decide to purchase, but that is not my goal with these books. I would remiss to not mention that I would not have finished both novels without the help of others. First, with my wife Jessica‘s patience and support, these books would have never seen the light of day. She was there for me when I originally wrote them, and she was there egging me on to get them past the draft stage so others might be able to read them. Both novels are dedicated to her thanks to her contributions. I also must give my sincere thanks to a coworker of mine who helped to review and suggest edits for the books. Her name is Kelsie Beaudoin and is also a fellow NaNoWriMo author. She’s not only a great writer, copy writer, and editor; but she also does amazing costume work as well. Her suggestions with grammar, logic, and style suggestions really helped polish both stories into their current states. Having paper copies of the books in hand is also like reaching the end of a very long creative journey. There is something about having one’s own words “professionally” printed on a page. Hopefully it will take less than a decade to get that particular story printed. It feels so strange not to be writing this year. Something feels missing not having every evening, every thought, and every moment of the month of November consumed by writing. Not devoting all my time to creative writing just feels weird. I’m, of course, better for not doing it. I’m not the nicest person when I’m consumed by 30 days of writing. So to feel some sort of accomplishment, and to satiate the desire to write, I’ll link to the first drafts of the previous two novels of years past. After much pain and suffering (at least it felt that way), I have met the NaNoWriMo 2005 challenge and my second novel, Bag of Snow, has reached the 50,000 word mark. It ends on a cliffhanger, so I still have at least 2 more chapters to write. Hopefully I’ll get to those in the middle of December. As of this post, I’ve finally caught up with the necessary daily word count since the start of the ‘competition’. So far about 22000 words, almost half way. If you’d like, you can read the story in progress via the link below. After some deliberation, I’ve decided to continue with NaNoWriMo. Or at least, I’ll try to. I almost didn’t write tonight, but with a newspaper article about the event and the fact that the word count graph is now online I decided to make a go. I decided to forego a bit of sleep so that I could get a couple of words down. Not too shabby to be starting in the middle of the night. Start reading Bag of Snow. How long has it been since an update…? 68 days!?! Maybe I should finally publish the new main site’s layout versus hesitating until it’s all done. Well it’ll have to wait until December at the least. Today marks the 8th year that this website has been online in some shape or form. Even the very first bit of content is still online. No surprise eh? I still plan on adding a “real” blog. Too bad work, life, and especially video games get in the way. It is also too bad that you have to have regular visitors in order to want to update, and you need updates in order to have regular visitors. Here it is 1:30 am in the morning of December 1, 2004 and I’ve just published the final chapter of Rusted Halo. I didn’t just want to hit that magical 50k mark, but I also wanted to have a complete story. That is what I ended up with late on November 30th. Now all that is left is to edit the beast, and get a few copies of it printed. If you are interested in a print copy, please feel free to let me know. Here is it, like 2 AM and I have just finished posting the last bit of Rusted Halo to get me over the 50,000 word mark! The story isn’t finished, it’s close, but I’ll be finishing it within the next two days. Amazing that this huge weight is now off of my shoulders. I’m not done yet thought, I have to write the climax yet.